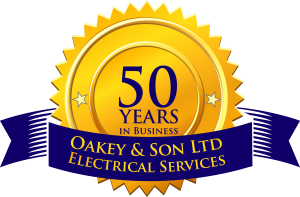 50 years of extensive and exceptional service and the business is still responding and supporting the Electrical needs of the local community and that of Gloucestershire. Ray Oakey founded his Forest of Dean based, Electrical company in the 60’s and has served the local and wider community for half a century. Ray’s son Steve followed in his father’s footsteps and undertook an Electrical Apprenticeship with the local college straight from school. With Steve in the business they soon became an Approved Contractor and grew to take on more staff. 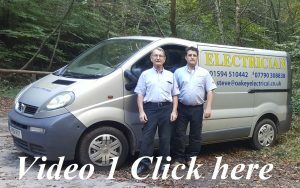 The company today undertakes a comprehensive Electrical Service with a ‘no job too large or too small’ approach, from Electrical Repairs, Installation and Testing to more complex jobs. Over the 50 year’s the business has grown and developed, yet still maintained its local focus and roots in the County. The business has grown over the years; from the 10 miles Ray used to have to ride his push-bike into the office to pick up his work and materials for the day, riding to each job and home again. The business was born from the local requests for work Ray had. This encouraged him to leave behind his paid employment in sawmills, farms and factories to open his shop in the local village.